Just a heads up for those looking for Cyber Monday deals - we have some great deals from Dell, HP, Alienware, Toshiba... listed on our site here. This year, as in years past, we have collected all the best coupon deals and posted them on our site for our Laptop Subscribers and visitors. 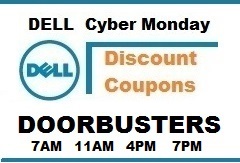 Right now, Dell's first round of Doorbusters are going live... 7AM EST. All these doorbuster deals have been listed on this webpage. Alert holiday shoppers can save up to 56% or more on popular Dell laptops, tablets and desktop PCs. Keep in mind, these discounted items are usually limited and may disappear at any moment - so act fast if you want to get the great savings. Alienware, which is owned by Dell, also has some great discounts this year. As you probably know, Alienware systems are not cheap and any savings are warmly welcomed when buying a gaming rig. The 6th gen (Skylake) processors are now out and many gamers are upgrading their systems for better performance. So if you're getting a head start on your holiday shopping - checking out all these Cyber Monday deals could prove helpful if you want to save money.